I dreamed last night that I entered a very modern train station and saw a one-car train tip sideways to avoid a car on its tracks and continue on a set of rubber safety wheels designed for that purpose. While I was watching, a tiny one-passenger train car much like a Smart car also tipped sideways and whizzed past, its passenger hanging upside down from his seat belt and yelling and gesticulating at me, and I realized I had inadvertently stepped onto the tracks and blocked its way. I went about my business in a hurry, hoping I didn’t encounter that passenger, who appeared to be a railroad employee. An interpreting assignment in Bogotá was offered so I jumped on it. I flew to Medellín on Saturday, and today my wife and I came to the capital. It’s great to be back in Colombia even if it’s just a week. Following are some curiosities that I found worthy of a picture. Yesterday’s menu referred to chicken wing drumsticks as “colombinas de pollo” (chicken lollipops). On our way to the airport today we passed this load of bricks. They tend to be hollow here and are used for structure rather than siding, although they may be exposed and varnished. This itinerant vendor was offering pineapples for CP$2500 (90 cents US) apiece. With the first scene, one realizes that this movie is going to be weird: an LA traffic jam turns into a spectacular song-and-dance routine, with dozens of dancers leaping and spinning over and around cars. However, when the first singer opens her mouth, her singing voice is a whisper. This sets the tone for the rest of the movie. Emma Stone plays an aspiring actress working at a Starbucks next to a major studio. Ryan Gosling is a frustrated jazz pianist. She goes from audition to audition; he gets and loses gigs that are beneath him musically. They dislike each other, warm up, fall in love, move in together. (She drops her erstwhile boyfriend in the process.) Gosling’s character dreams of buying a jazz club and making sure jazz stays alive. She encourages him in his dream and even creates a logo for the club. To make a living he takes a job with a fusion jazz group and goes on tour. She is upset by his absence and they have an argument when he has a brief chance to return. She accuses him of selling out his dream. She writes a one-woman show and rents a theater to present it. He misses her opening night because of a photo shoot for his band. Her show is a flop and he wasn’t there, so she goes home. He hears a phone message from a director offering her a job interview, and drives cross-country to her parents’ house to pick her up for it. She refuses, but changes her mind at the last minute and goes back with him. At the interview she is offered a movie job in France, which she takes. They pledge each other their love but recognize that they have no idea what will happen. Five years later, we see her back in LA in an expensive house, with kids and a tall handsome husband who looks a lot like her pre-Gosling boyfriend. They go out for an evening, get caught in traffic and take the nearest exit, where they end up at the jazz club she once visited with Gosling. The club’s logo is now the one she designed for him. There is a band playing to a full house. Gosling spots her and plays a composition she had heard him play before, and we see sweet images of what their life would have been like if they had been together. (These scenes are much more middle-class than her current life appears to be.) Then she goes home with her husband. As I said at the beginning, the whispery voice in the first song sets the tone for the film. 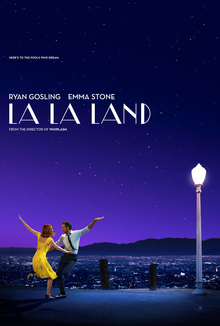 Throughout the movie, it is obvious that Gosling and Stone are neither dancers nor singers. They sing and dance competently, but nothing like Fred and Ginger, Julie Andrews, Judy Garland, Danny Kaye, Bing Crosby. Gosling does his own piano playing, which is lovely but not technically complicated. (The internet tells me he learned to play in three months for the role.) The skilled performances are by the secondary characters who are professionals. So we have a musical that does not star singers or dancers, and we have a romance that is not a love story. The story line left me very unsatisfied: These people don’t have cell phones? Is she just shallow or did something happen to end their relationship? How can a movie be so spectacular and work so well when so many things are not quite right? I don’t know. 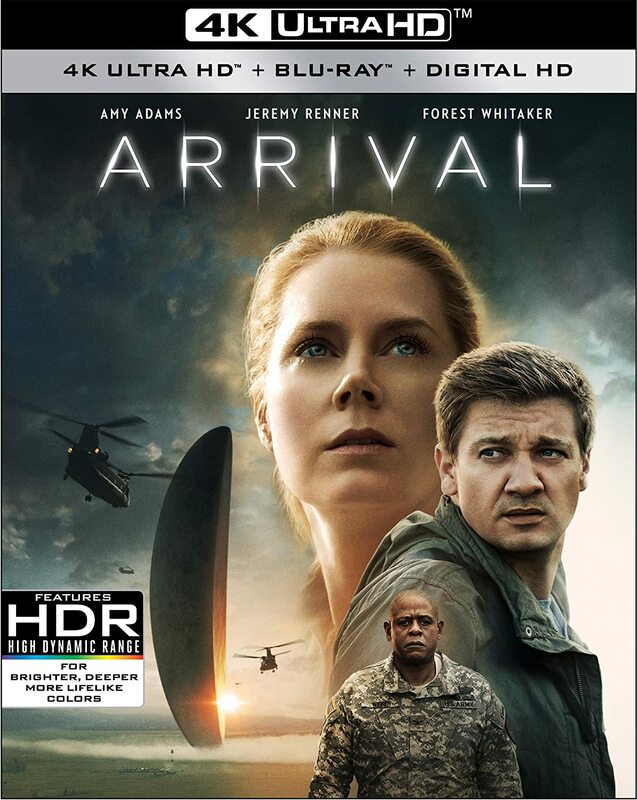 Arrival is a movie about a linguist, Louise Banks, selected by the government to communicate with aliens that arrive in twelve huge vessels parked around the globe. It seems to have been written by someone who has dabbled in linguistics but has little idea of what linguists actually do. An army officer arrives at Louise’s door with a recording of noises that are the aliens’ response to a certain question. He proposes that Louise analyze the language by means of such recordings. Louise tells him that analysis will require face-to-face interaction and can’t be done as he proposes. As he leaves to interview the alternate candidate (apparently Louise’s rival), she tells him to ask the alternate what the Sanskrit word for “war” is and what it means. By the time this interaction takes place, the colonel has already selected her, so the point of the Sanskrit word discussion is unclear. In any case, in all languages, words have more than one meaning or use, so linguists discussing definitions must include context rather than simple definitive statements like these. This is in fact one of the main points of the plot, which hinges on the issue of multiple meanings, specifically the fact that “tool” and “weapon” could be alternate definitions of the same alien word. The movie indicates that Louise knows multiple languages; she has translated sensitive Farsi recordings for the government, she speaks fluent Chinese with the president of China, she announces in class that she is going to address the question of why Portuguese sounds like it does. However… if the government needs Farsi recordings translated urgently, they are not going to entrust them to an American university professor, they’ll use an Iranian translator. Why? Because someone who has learned half a dozen languages as an adult is unlikely to know any of them at the depth and nuance necessary for such sensitive work, no matter how bright she is. Language learning requires vast amounts of time and context, and there is no indication that Louise has ever lived in Iran. Nowhere is there any indication that Louise has ever done fieldwork in a previously unwritten language. Her first session with the aliens makes it clear that she has no experience in monolingual elicitation techniques. She doesn’t even have the standard 100-word list used by field linguists for basic phonological analysis. The military would have been far better off recruiting SIL missionary linguists whose training is geared precisely to learning and analyzing previously unwritten languages. Louise’s scientist companion asks her about the idea that learning new languages rewires one’s brain. She tells him about the Sapir-Whorf hypothesis, which suggests that one’s view of reality is filtered by language. This becomes the heart of the movie; as Louise delves into the alien’s written symbols, she experiences flashbacks of things that haven’t happened yet, and eventually we discover that the aliens’ language allows people to see the future. However… this begins before there’s even any indication that they are delving into tenses (past, present, future), and it doesn’t seem to matter that she’s only learning the language’s written form. And it only happens to her, not to the team working with her and not to linguists at the other 11 sites who are also learning the language. And as usual, time paradoxes are created and not resolved. Louise learns something in a forward flashback that allows her to solve a problem now… but knowing about it now means the conversation she sees in the future would not happen the same way. Still, it was fun to see a linguist featured in a movie, even if it’s a caricatured view, and to have the chance to pick a story like this apart. I will definitely watch it again. My wife’s birthday serenade included this classic love song by Pedro Flores. The lyrics are below along with a rough translation. ‘Niño del Alma’ es un tema que hizo parte de la producción discográfica Canción de Navidad, prensaje especial de la Universidad de Antioquia. Este bambuco fue escrito por el célebre compositor santandereano Luis Uribe Bueno en 1953, y desde esa época engalana el repertorio de canciones navideñas colombianas. El arreglo estuvo a cargo del maestro nariñense Jaime Chávez. I managed to pull off a complete surprise with this birthday serenade for Alicia last night. The Trio América is considered one of the best in Colombia, with a 52-year history. It is now in its second generation with dad Oscar and sons Elkin and Nelson. This song is not as polished as their work tends to be because it wasn’t in their repertoire; they arranged it a couple of hours before the serenade. I requested it because it was an important part of my courtship of Alicia. The original version was recorded by Nino Bravo. Alicia and I were dancing to it when I asked her to marry me. Elkin, on the right, creates most of Alicia’s arrangements. He’s a musical genius, possibly the best requinto player in Colombia (the requinto is a small guitar designed for picking), and able to play nearly any instrument. I will post other songs from the serenade as I get them uploaded. Enjoy!